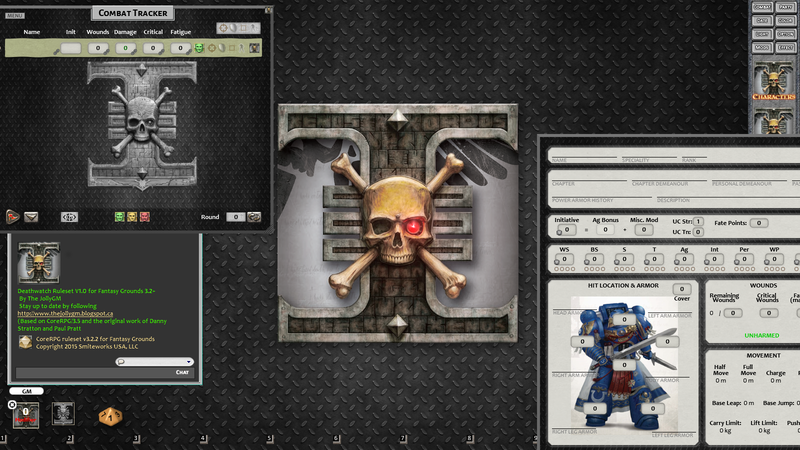 Hi all, I am happy to say that you can get the updated Deathwatch Ruleset for FG 3.2+ here!! V1.04 - Fixed a few bugs, and you can now drag and drop weapons to the character sheets with out causing a script error if the ammo is 0. V1.03 - Corrected Talents glitch, Fixed ammo counters, corrected CSHIELD effect, Added TERMI effect. V1.02 - Corrected duplication bug, when items added to talents tab, it would also show on the gear tab on your character sheets. V1.01 - Corrected character sheets that were reflecting Black Crusade stats, Added basic Cohesion Counter to combat page. This will be developed further at a later date. Many thanks to Paul Pratt for his coding help and his original code that allowed me to do this! Last edited by ShotGun Jolly; June 23rd, 2017 at 04:57. Updated wiki link for WH40K: Deathwatch ruleset to point to this new thread. Updated to make corrections of several errors on the character sheet, and also added a basic Cohesion tracker. This will be developed further at a later date. Just doing all the little hotfixes people were noticing! Thanks for your Help everyone! See OP for newest update. Very nice work, im thinking I may move my group to using this, we still play in person, but this will make things so much smoother. Newest update added. Fixed a few bugs, and you can now drag and drop weapons to the character sheets with out causing a script error if the ammo is 0. Last edited by ShotGun Jolly; June 23rd, 2017 at 04:55. How does the ruleset handle Righteous Fury, and Hordes? No Righteous Fury. Its not like D&D where the crit is determined from the hit. The issue being once the damage roll is determined to be 10, there needs to be a roll to confirm using the same mods as the original attack roll. No way in FG to go back and capture that old roll. I can get a die to roll a d10, if you just rolled a 10 for damage, but it won't add it to the damage roll. Hordes, I am not sure if Shotgun added anything in for hordes, I am interested to know also.